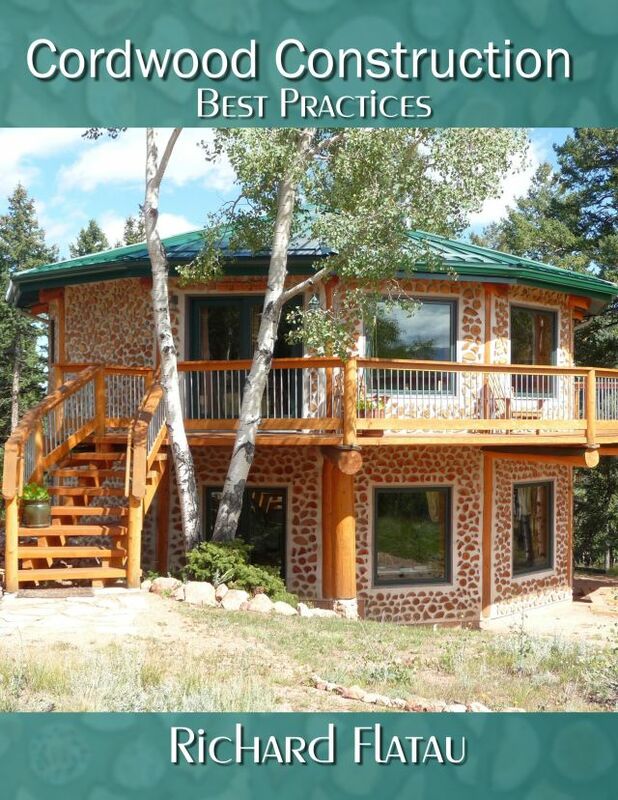 Here are Patti’s directions on how to build one for yourself! We bought your book several years ago after moving to northeastern Michigan from the Detroit area. 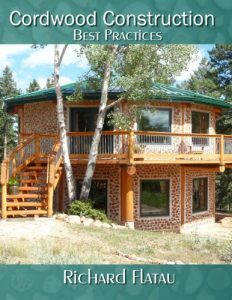 I was interested in building a cordwood writing studio at the back of our 13 acres of hardwood forest, that butts up against a state recreation area. After figuring out how much work this meant, we kind of gave up the idea. 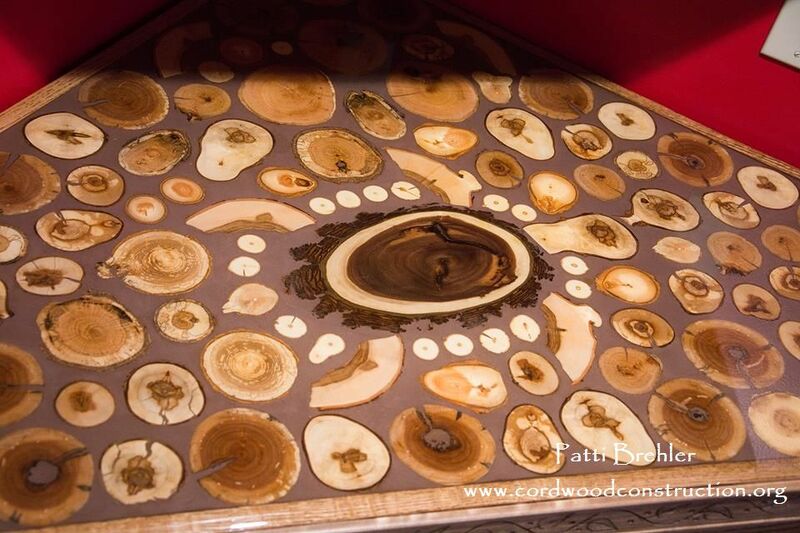 But, I still had an itch to do some cordwood! 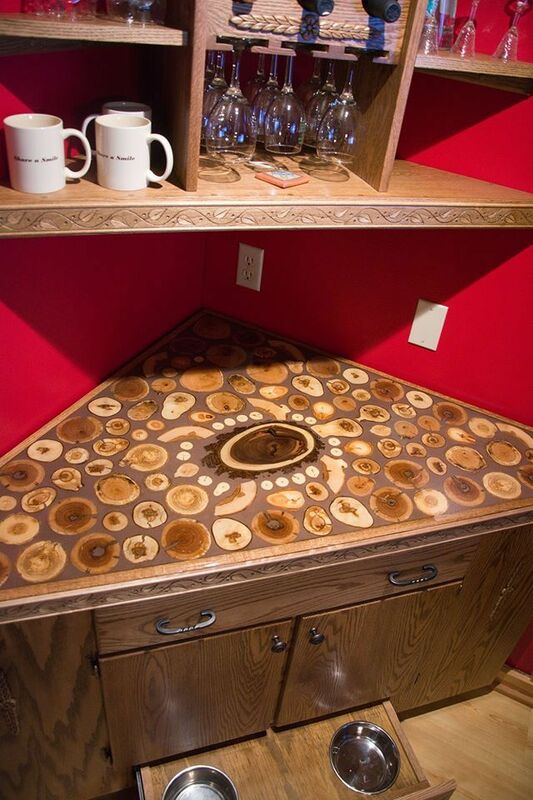 My husband, Andy, is a nice woodworker. I’ve always wanted him to build me a corner cabinet in the kitchen as a “beverage” counter, with a lower drawer to house the dog dishes, and doors to put the dog food containers in. Well, he finally got around to it in 2015. First step, he build the wine rack at the top, then started on the bottom cabinet. 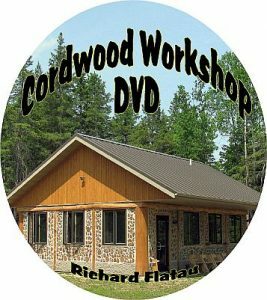 He made a triangle template for me to make the cordwood design for the counter top. That was my job! 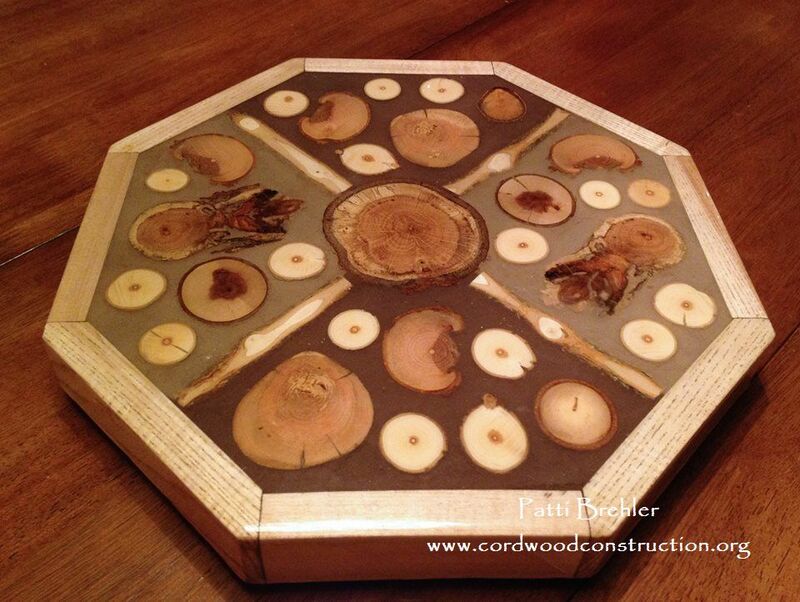 I knew I wanted the center piece to be a slice of walnut from David Miller’s Sawmill in Mio, MI. The other pieces I pulled from our wood shed – ash, birch, maple and oak. Andy built a jig for his bandsaw so I could slice the wood pieces the same – 3/4″. I made my design on the template and the turtle just sort of came to life on it’s own. We did a few things to experiment. First, Andy glued a test piece on a board to see if just the glue would be enough to hold the wood slice on for sanding. That worked just fine. We decided on the dark grout and I went to work gluing the pieces to the counter top. Andy did an initial sanding and coated them with polyurethane to protect them from the grout. After grouting, he sanded again to clean them up and added another coat of polyurethane. We learned how to pour the epoxy on the lazy susan, so felt confident when we did the counter top. 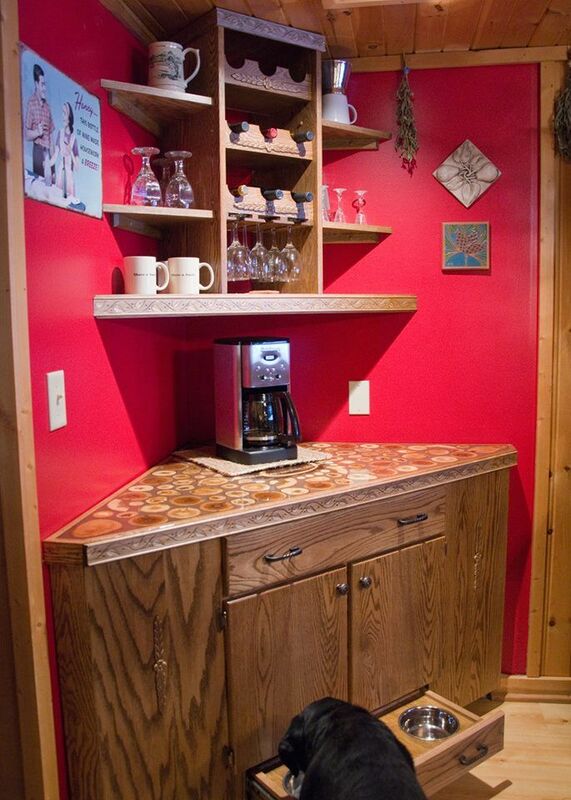 We did three pours on the countertop. The first pour was to seal and did not result in a flat surface. The second pour made it flat, but we made a mistake by adding “dams” at the edges. We weren’t sure about letting the epoxy run over the edges because we knew we wanted to add the decorative piece on the front edge. But, it was evident that we needed a third pour to let run over the edge for a more finished look. We’re very happy with the results! Here’s the photo of the lazy susan, which is a nice compliment to the cabinet. Here is the 15 1/2″ octogan Lazy Susan we built as a practice piece, so I could try out grout colors, and we could test the epoxy pour.